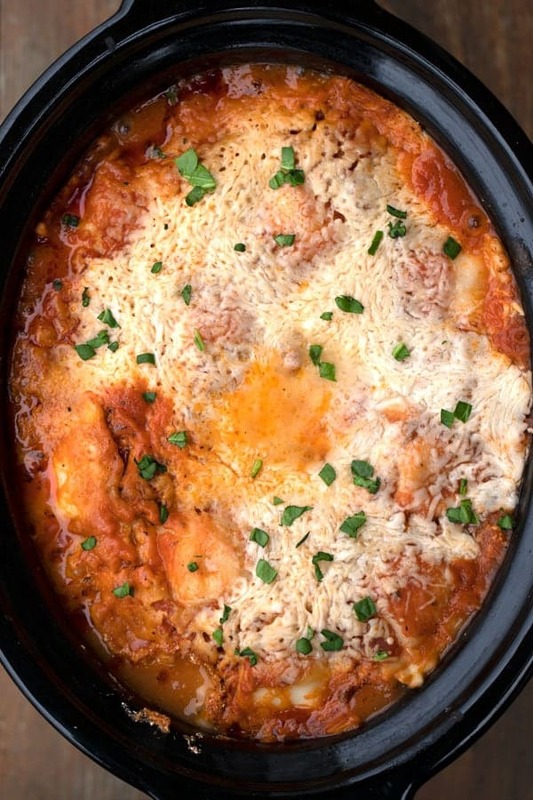 This easy crockpot lasagna with ravioli is such an easy crockpot lasagna recipe. 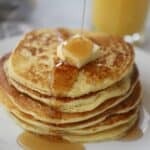 It takes only a few minutes to throw together and is ready when you are. 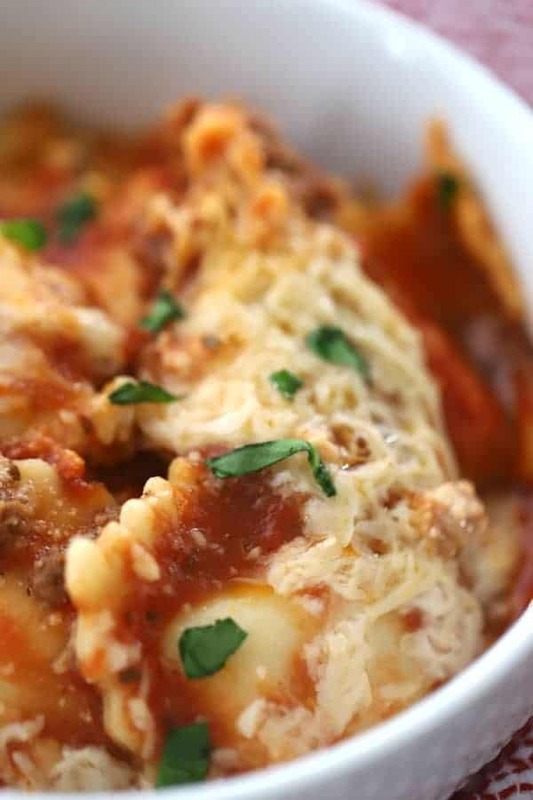 This crockpot ravioli lasagna makes dinnertime a breeze! This slow cooker lasagna recipe calls for a lot of the basic lasagna ingredients. 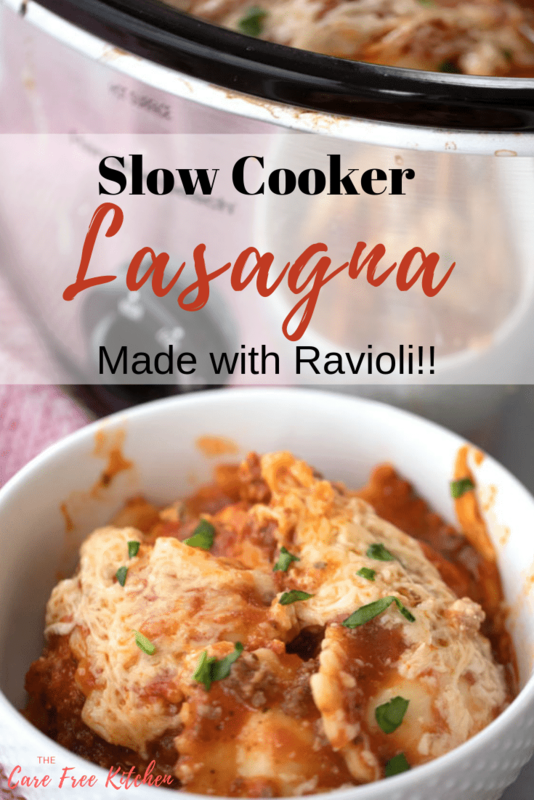 Read along and I’ll show tell you some of my shortcuts to this slow cooker ravioli lasagna. Noodles: For this slow cooker lasagna with ravioli recipe, I used frozen ravioli. I found it in the freezer section at the supermarket. It’s inexpensive and works great for feeding a crowd and is delicious in this easy slow cooker lasagna. You can use the meat filled ravioli or the cheese filled ravioli. My crew prefers the cheese ravioli but either works great. 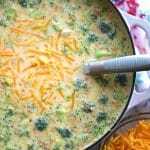 Cheese: There are several different kinds of cheese in this dish. The cheese you see in the pictures, on top of the slow cooker lasagna with ravioli is shredded Mozzarella and shredded Parmesan Cheese. 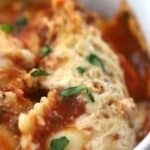 If you don’t have enough ricotta just sub half ricotta and half cottage cheese in this ravioli lasagna slow cooker recipe. Meat: For the meat in this recipe I use a combination of half ground hot sausage and half beef. You can cook the meat at the time you prepare this slow cooker lasagna or you can try this meat prep I’ve been doing for years that saves me so much time and cleanup around dinner time. One thing I like to do, and it helps me prepare for meals like this, is to buy a pound of ground hot sausage, 2 pounds of hamburger and prepare the meat ahead of time. I do it every couple of months or so and then I have a meat combination ready for spaghetti or other Italian dishes like this. I just cook an onion or two in some olive oil until caramelized, add a couple of tablespoons of minced garlic, about a half cup of water (this will help break up your meat) and then brown the meat. It’s simple. I let the meat cool and then add 1 cup of meat to a quart size freezer bag and then freeze it. It’s already cooked and portioned out for meals like this and spaghetti. Easy peasy! 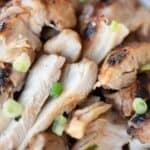 To make the meat mixture for this recipe, cut up half of an onion. Sautee the onion in a skillet with 1 Tablespoon of cooking oil until it is golden brown. Add a tablespoon of minced garlic. Cook until the garlic turns translucent. Add the meat and a little water. Use a spoon and break up the chunks of meat until it is in small chunks. Cook until the meat no longer has pink in it. This is a total time saver for dinners! Spaghetti Sauce: You can use your favorite here. If you are in the mood to make some homemade Marinara sauce, I have a killer recipe here. Once you try that Marinara recipe, your life will forever be changed. 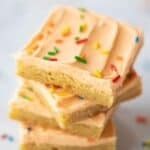 It’s made with really simple ingredients but holy smokes, it has so much flavor! 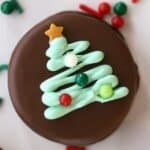 I understand it’s sometimes impossible to make everything homemade. I am in the stage of life where I live with picky eaters. My family’s favorite is Hunt’s Traditional Spaghetti Sauce. 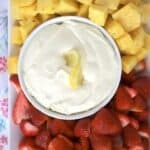 It’s simple, no chunks, and has great flavor. Whatever red sauce your family loves, use it in this easy slow cooker lasagna. 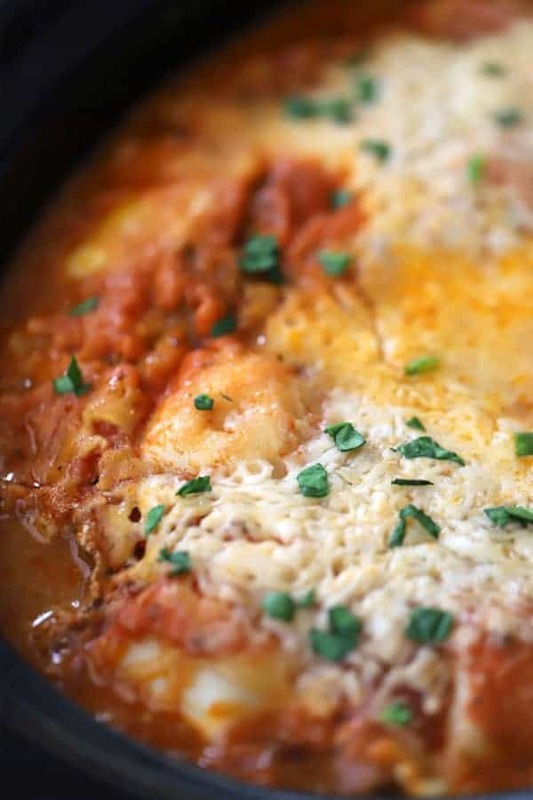 This crockpot lasagna with frozen ravioli is so easy and everyone loves it! This recipe is all about the layers. To begin you need to prep for each layer and then the assembly of this easy crockpot lasagna recipe will come together in just a few minutes. Chop half of a small onion and cook it in a frying pan with a tablespoon of olive oil until it is golden brown. Add a teaspoon of minced garlic and heat until it is translucent. Add the hamburger and spicy sausage. Cook the meat until it is no longer brown. I like to do this in really large quantities and then freeze in 1 cup portions in ziplock freezer bags for another day. This method makes dinner time so easy on busy days. I can throw a meal like this together or spaghetti in just 20 minutes. Add the marinara sauce to the meat and mix until combined. Now your meat layer is ready. Combine the ricotta, most of the mozzarella, the parmesan, the egg, and spices. Just mix it up. You can use the fresh Ravioli from the refrigerator section or frozen ravioli here. You’ll need about 2 pounds. If it’s frozen, keep it frozen. 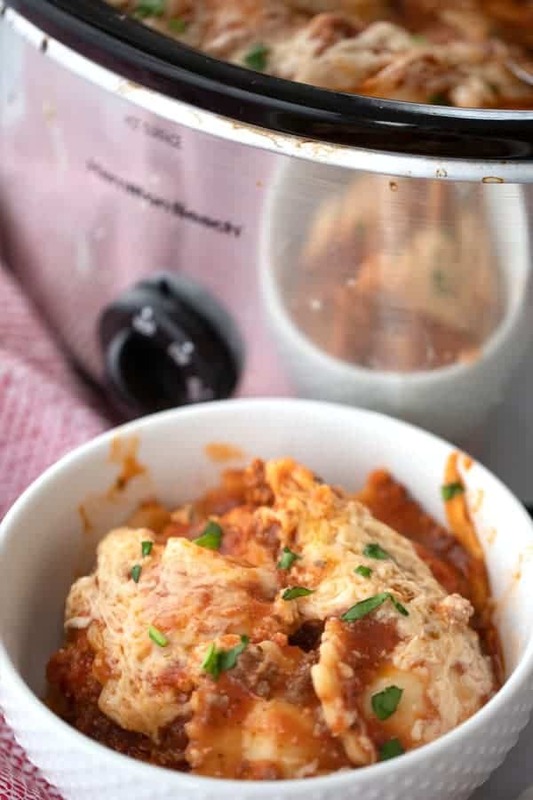 You can also use no-boil lasagna noodle for this ravioli lasagna crockpot recipe if your family doesn’t like ravioli pasta. Just make the recipe the same and substitute the no-boil lasagna noodles for the ravioli. Slow cooker: Be sure to spray your slow cooker with non-stick cooking spray. This will really help with cleanup. You will do 4 layers of the meat sauce, 3 layers of the noodles and 3 layers of the cheese. It should work out something like this. When you make a meal like a crockpot lasagna, sometimes the cleanup is rotten. If you spray your slow cooker with non-stick spray, that helps. Another thing that helps clean off the cooked on food from your slow cooker is a dryer sheet. It is almost like magic. Get as much food as you can out of your slow cooker and then fill it with hot water and a squirt of dish soap. The magic trick is to add a dryer sheet to your slow cooker and it will clean up so easily. Let the slow cooker sit for about 2 hours, or overnight, and the food will become loose and you can just about wipe it clean. Trust me on this one, it’s almost like magic! 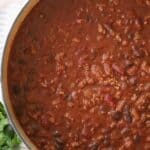 If you love crock pot meals, here are a few more you’ll love! 2 pounds Ravioli Frozen is what I used but fresh works great too. In a skillet on medium heat, add the tablespoon of olive oil and the onion. Stir and cook on medium heat until the onion is golden brown. Add the minced garlic and continue to cook for about 2 minutes or until the garlic is translucent. Add the sausage and the beef and cook until it's no longer pink. Add the spaghetti sauce and stir until combined. 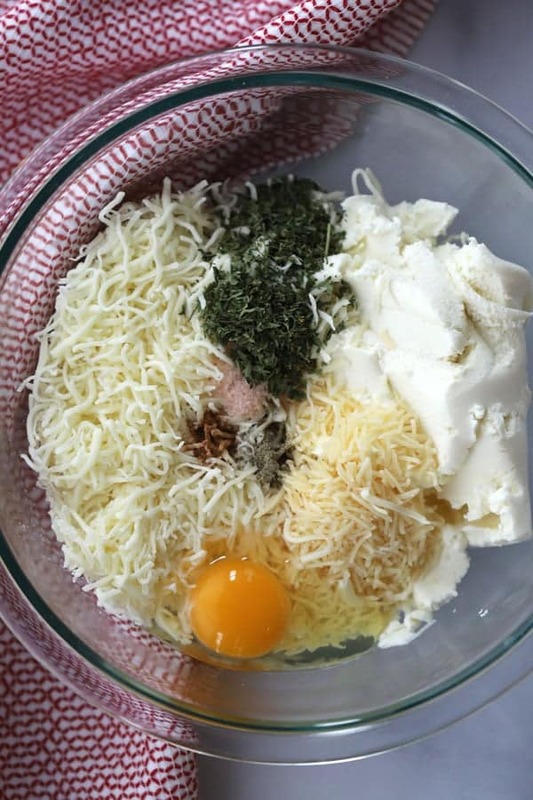 In a mixing bowl, combine the ricotta cheese, 1 cup mozzarella cheese, 1/2 cup parmesan cheese, eggs, parsley, garlic powder, nutmeg, salt, and pepper. Stir until combined. To assemble the lasagna you will do it in layers. First, Add about a cup of meat sauce to the bottom of the crockpot. Add a layer of ravioli. Touch the edges of the ravioli together but don't stack on top of each other. Add the cheese mixture, You should be adding about a 1/3 of the cheese mixture. and then the sauce mixture, about 1 1/2 cups each time you layer. 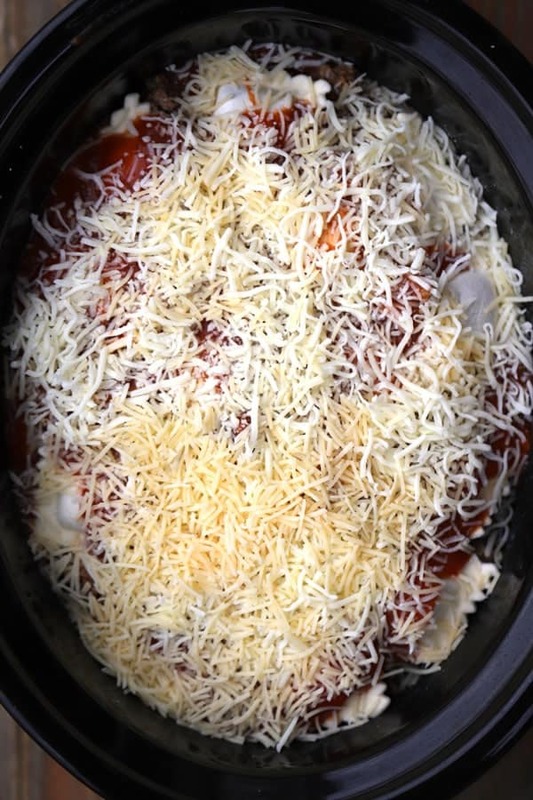 After you assemble the crockpot lasagna, add the remaining 1/2 cup of mozzarella cheese and 1/4 cup of parmesan cheese. Bake on high in the crockpot for about 4 (3 hours if you're using fresh ravioli) Enjoy!